Olly Murs has just announced another UK tour. His second album, In Case You Didn't Know, is now going back up the charts, having gone straight in at No. 1 on its release last November. There is no doubt that the boy is on a winning streak right now. So why is he so successful? Pop music likes to have a cheeky chappy around to provide some happy music and fun. For some time we relied on Robbie Williams to play that role but since he crashed and burned we have been waiting for a replacement. Along came Olly Murs courtesy of The X Factor. Olly entered The X Factor in 2009 and came runner-up to Joe McElderry – remember him? During the contest Olly showed that he was a born showman and it was clear that here was someone who had a real future in the entertainment business. Failing to win The X Factor was probably a blessing in disguise as we are seeing a pattern emerge: contestants who finish second do remarkably well afterwards. 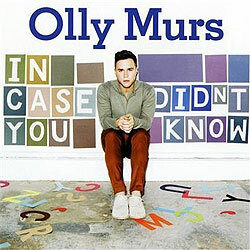 In February 2010 Olly released a self-titled album, Olly Murs, which went to No. 2. In 2011 he completed a sell-out UK tour. Not content with that Olly has been venturing into TV and radio shows as a presenter. His confident, amusing and down-to-earth character makes him particularly suited to this, his most notable gig to date being co-host of The Xtra Factor with Caroline Flack. In Case You Didn't Know was released 12 months after his first album. Olly was involved in the writing of all but one of the songs on the album. He has altered his musical course somewhat, saying that he wanted to achieve a more soulful sound compared to the first album. However the overall effect remains upbeat and cheery with just 2 ballads out of the 13 songs. The album has a modern electronic pop feel with bouncy numbers such as the single Heart Skips A Beat being much in evidence. Underlying that is a nod to the past, with Dance With Me Tonight being influenced by doo-wop and jive. Elsewhere there are touches of ska, indie pop and Motown. Running throughout is a healthy dose of fun and enjoyment. You will not find any mournful introspection here. Olly Murs succeeds because he provides just what many people want i.e. straightforward happy tuneful pop delivered by an engaging personality. I think his future is bright.